Also available as an app for Android and iOS / Apple iPhone. Print book also available from the Book Depository (free worldwide postage) and Amazon UK (free UK postage). Perfect for family explorers or romantic adventurers. 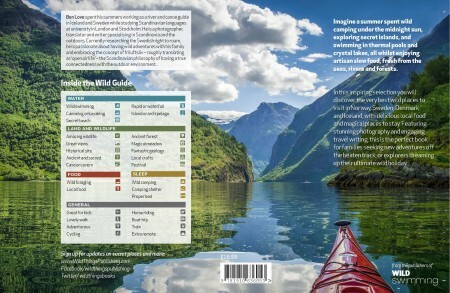 With informative descriptions and 24 detailed maps, including the best places for secret beaches, fantastic hikes, canoe trips and mountain train and boat adventures, as well as special places in which to stay, enjoy the best local food and discover the wildlife. Travelling from high above the Arctic Circle to the very south of Sweden and Denmark the landscapes you will discover are as varied as they are idyllic. Ben Love studied Scandinavian languages at university in London and Stockholm spending his summers working as a river and canoe guide in Iceland and Sweden. He is a photographer, translator and writer specialising in Scandinavia and the outdoors. 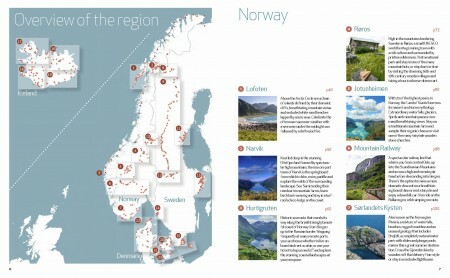 Currently researching the Swedish right to roam, he is passionate about having wild adventures with his family and embracing the concept of friluftsliv – roughly translating as ‘open air life’, it is the Scandinavian philosophy of having a true connectedness with the outdoor environment. Above the Arctic Circle are a chain of islands defined by their dramatic cliffs, breathtaking mountain vistas and secluded white sand beaches lapped by azure seas. Celebrate the often warm summer weather with a sea swim under the midnight sun followed by a driftwood fire. 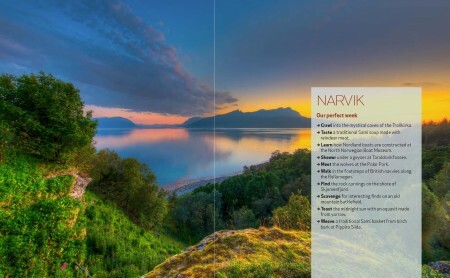 Nestled deep in the stunning Ofotfjord and framed by spectacular high mountains, the iron ore port town of Narvik is the springboard from which to hike, swim, paddle and explore the wilds of the surrounding landscape. See Sami tending their reindeer in mountain farms, learn birch bark weaving and stay in a turf-roofed eco-lodge on the coast. Historic sea route that wends its way along the breathtakingly beautiful coast of Norway from Bergen up to the Russian border. Stopping frequently at many remote ports, you can choose whether to live on-board and rent a cabin, or use your ticket to hop on and off and explore the stunning coastal landscapes at your own pace. High in the mountains bordering Sweden is Røros, a small UNESCO world heritage mining town with a rich culture and surrounded by pristine wilderness. Visit a national park and stay in one of the many mountain huts, or step back in time by visiting the charming 16th-and 17th-century wooden villages and taking a tour in a horse-drawn cart. With 29 of the highest peaks in Norway, the ‘Land of Giants’ borrows its name from Norse mythology. Extraordinary waterfalls, glaciers, fjords and mountain passes command breathtaking views. Stay on a traditional mountain farm and sample their organic cheese or visit one of the many fairytale wooden stave churches. A spectacular railway line that whisks you from central Oslo, up into the Scandinavian Mountains and across a high and remote plateau before descending into Bergen. There’s the option to make a more dramatic descent on a breathtaking branch line or rent a bicycle and enjoy a downhill, car-free ride on the Rallarvegen, wild camping on route. Brujfell, a completely natural water park with slides and plunge pools makes this a great summer destination. Cross the Gjeveden lake by wooden raft Huckleberry Finn-style or stay in a secluded lighthouse. Some call this Europe’s last true wilderness – a vast and incredibly beautiful landscape. Wild swim under the midnight sun, climb Sweden’s highest mountain, watch the aurora borealis, canoe camp on the lakeshore, and enjoy a wood-fired sauna. You will also meet the reindeer-herding Sami people famous for their folk crafts. Discover remote villages and landscapes on this inland train journey from the forests of mid-Sweden to the Arctic tundra. Not exactly an express train, the driver frequently stops to point out wildlife such as moose and bears. Taste smoked trout from the Vojmån river, and hunt for the black vanilla orchid by the Ljusnan river. Mountains, rivers and some of Sweden’s biggest and most impressive waterfalls feed a vast network of lakes, perfect for exploring by canoe. Slide down the river pools of Ullån with wild swimming galore. 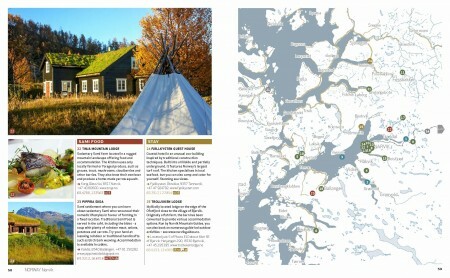 Forage for cloud berries, try the local birch sap wine and stay in a cosy mountain lodge. Famous for its soaring granite coast, this breathtaking landscape has superb hiking, remote beaches and uninhabited islands. 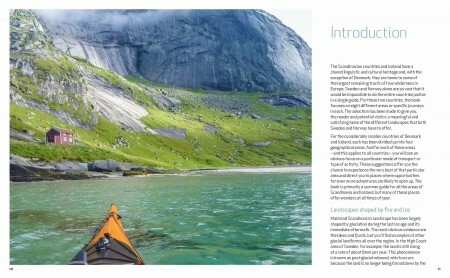 For the more intrepid, canoe out to find secret caves, sleep in a lighthouse or try the famously pungent Swedish delicacy of fermented herring. This is a highly accessible yet fairytale landscape, rich in both wildlife and heritage, where girls dance around the Maypole wearing fresh flowers to sounds of traditional fiddle music, and wolves and lynx still roam. Be enchanted by the red timber houses, explore by horse and cart and stop to swim in the myriad lakes. A short boat ride from the Swedish capital takes you to the heart of over 30,000 islands, islets and rocks that make up this spectacular archipelago. There’s snorkelling, swimming and canoeing galore, but you can also find gemstones, ruined castles and an ancient labyrinth – all linked by simple passenger ferries. A spectacular granite island, with sheltered and shallow waters easily explored with a rented kayak. Wild camp on uninhabited islands, resupply at the small harbour villages, and enjoy an abundance of seafood. Inland you’ll find wildflower meadows and remains from the Bronze Age and Viking periods. pastoral coastal landscape rich in ancient standing stones and rock carvings. Make a slow tour by bicycle, swim from white-sands beaches, camp in the dunes and taste produce from the many organic farms – including delicious local cider. Convenient for Reykjavik, this is an area packed with huge waterfalls, black-sand beaches, volcanic thermals, glaciers, secret hot springs and much more. Geysers spout boiling water 40 metres up into the air and you can snorkel a fissure between two continental plates. Unusual delicacies include rotten shark! Stretching from the glacier-covered volcano of the Snæfellsnes peninsular, where Jules Verne set off to find the centre of the earth, to the West Fjords with their remote fishing villages and fjords. There are numerous hot springs, often in amazing coastal settings, and in the north the indigenous horses outnumber the people. A steamy volcanic region of remote plateaus and volcanic sands. There is Dettifoss, the most powerful waterfall in Europe, mighty glacial rivers that have carved deep canyons and glaciated mountain peaks. Spend a day inspecting boiling mud pots, subterranean springs and colossal lava features before relaxing in a restorative thermal bath. Iceland’s most remote region, where the lone main road hugs the coast, taking you past the blue glow of an iceberg-filled lagoon and the Vatnajökull glacier, home to the largest national park in Europe. Hunt for ice diamonds on black sand beaches, and shower under a steaming waterfall. Discover why this is called the ‘Land of Fire and Ice’. Largest of the over four hundred islands that make up Denmark, Sealand is also where you’ll find the capital, Copenhagen. From the city it’s an easy bicycle trip out to one of the many long sandy beaches. Spend a long weekend camping by the sea, visiting incredible Viking remains and eating delicious organic food at the Fuglebjerggaard café. Spend halcyon days exploring the idyllic and magical island of Funen in a horse-drawn caravan. Then take to the sea in a kayak and explore the archipelago of 96 islands that decorate the south coast – with a great network of unique architect-designed coastal shelters so you can camp overnight in style. Defined by its dune-backed white sandy beaches, the northern area of the Jutland peninsula is the perfect place for a laid-back summer adventure filled with fresh fish dinners, glorious sunsets and beach combing for amber. Rent a bicycle and visit one of the many ruins, museums and Viking remains. ferry (if no bridge) and bicycle. Bornholm alone has ruined castles, prehistoric burial sites, sandy beaches, towering cliffs and ancient woodland to be explored. The Scandinavian countries and Iceland have a shared linguistic and cultural heritage and, with the exception of Denmark, they are home to some of the largest remaining tracts of true wilderness in Europe. 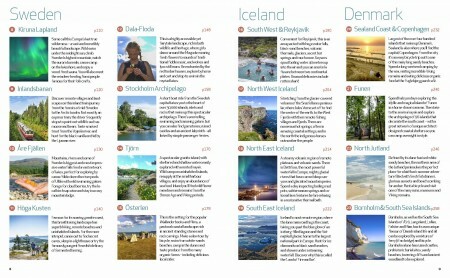 Sweden and Norway alone are so vast that it would be impossible to do the entire countries justice in a single guide. For these two countries, the book focuses on eight different areas or specific journeys in each. 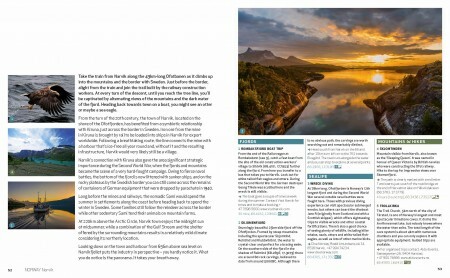 The selection has been made to give you, the reader and potential visitor, a meaningful and satisfying taste of the different landscapes that both Sweden and Norway have to offer. For the considerably smaller countries of Denmark and Iceland, each has been divided up into four geographical areas. And for each of these areas – and this applies to all countries – you will see an obvious focus on a particular mode of transport or type of activity. These suggestions offer you the chance to experience the very best of that particular area and direct you to places where opportunities for even more adventures are likely to open up. 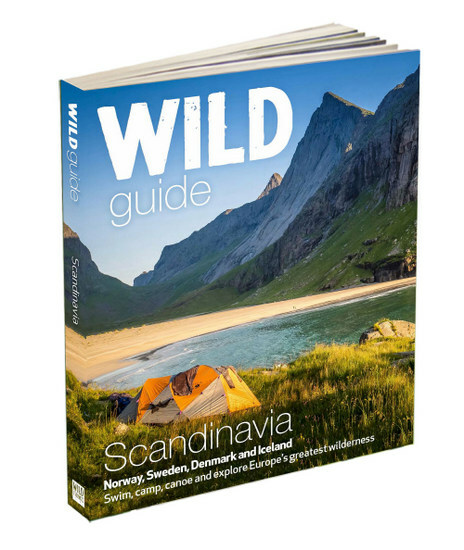 The book is primarily a summer guide for all the areas of Scandinavia and Iceland, but many of these places offer wonders at all times of year. Mainland Scandinavia’s landscape has been largely shaped by glaciation during the last ice age and its immediate aftermath. The most obvious evidence are the lakes and fjords, but you’ll find examples of other glacial landforms all over the region. In the High Coast area of Sweden, for example, the land is still rising at a rate of about 8mm per year. This phenomenon is known as post-glacial rebound, which occurs because the land is no longer being forced down by the weight of ice. It will continue to rise until it reaches an equilibrium level. In this area alone the land has already risen 800 metres since the end of the last ice age. Iceland is altogether different and in geological terms a much younger country. It also lies on the divergent boundary between two tectonic plates – the Eurasian and the North American – directly above a hotspot known as the ‘Iceland plume’. Seismic activity at this boundary around 16 to 18 million years ago is believed to have caused the creation of Iceland’s land mass, which is characterized by numerous volcanoes and hot springs. Danish, Swedish and Norwegian are all mutually intelligible, whereas modern Icelandic has changed very little from the Old Norse that the original settlers from mainland Scandinavia brought with them to Iceland in the ninth century. These countries display many other cultural similarities such as shared customs and festivals, but at the same time there are also obvious differences. These are often the basis of stereotypical jokes and friendly rivalries between the different nations. In the north of Sweden and Norway, where a spine of mountains forms their common border, you’ll meet the indigenous Sami people. Their lands also span Finland and the Kola Peninsula of Russia. The Sami, who have kept their own language and customs, traditionally herded reindeer in the mountains and forests, or fished in the lakes, rivers and along the Norwegian coast. Families that are no longer nomadic and are settled at a particular farm are known as ‘sedentary Sami’. Some of the areas of Norway and Sweden included in this book have significant Sami communities, and details of where you can find out more about their fascinating culture are included. The concept of friluftsliv, which roughly translates as ‘open-air life’, is the Scandinavian philosophy of having a true connectedness with the natural environment. It means being outdoors, breathing the fresh air and living in harmony with nature and the landscape. The term itself, written down for the first time in 1859 by the Norwegian poet Henrik Ibsen, is relatively new but the concept itself is older. If you intend to explore the outdoors in Scandinavia, make some time to read a little more about the benefits of friluftsliv before you leave. Also included in the book are my selection of special places to eat and stay. Generally speaking, the cafés and restaurants recommended specialise in local food prepared with organic or sustainable ingredients. In terms of places to stay, those listed are unusual, particularly convenient for outdoor adventures, or perhaps require a little local knowledge to discover. 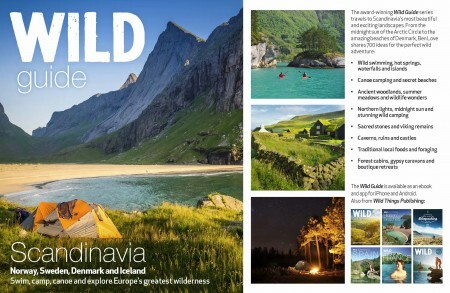 In some areas covered by the book, where spectacular wild camping is a very obvious and possible option, then you’ll find fewer accommodation options. If you want to forage, the rural and coastal landscapes in the book offer ample opportunities for gathering berries and mushrooms, as well as fishing. Indeed, this is how many of the rural restaurants included in the book obtain their super-fresh and delicious ingredients. Using local, traditional and seasonal produce but preparing it in new ways even has its own name – ‘New Nordic’ cuisine – and it’s delicious! My love of this region has led me to study the Scandinavian languages and spend many years exploring its spectacular landscapes. 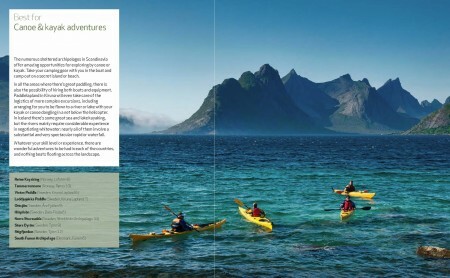 With its fascinating culture and history, I’m confident that like me, you will also enjoy discovering wild Scandinavia.